Kreature specialise in professional affordable responsive website design & development, developing responsive mobile friendly websites and apps, custom WordPress development and bespoke ecommerce projects for small to medium sized businesses, offering our clients a professional agency designed static or dynamic website at a very affordable and realistic price. We have over 14 years of expertise in website design & development and cover all digital fields including SEO (Search Engine Optimisation), logo design, banner ads, HTML5 and CSS3, Jquery, WooCommerce, ecommerce, WordPress and CMS, print design, and more. We can improve your online presence and work on your search engine ranking to ensure your website is attracting the right customers to your business and we can work on your online content. We’ve loved working on hundreds of our own customer websites, built websites under the umbrella of much larger agencies, created bespoke Apps and CD roms, banner ads, logos, flyers and more. We’ve worked for the NHS on large intranet and internet sites for mental health and NHS provisions/resources, built small and large scale sites for small, medium and large companies and we’ve even worked on an electric vehicle charging system for Transport For London which was eventually rolled out across Europe. We can work just as easily with a large board of directors as we can with a local sole trader and we treat all jobs with the same level of detail and perfection. If it involves pushing a pencil, wiggling a mouse, coming up with design visuals or typing keys and creating bespoke hand crafted code then we can do it. We are based in Barrowford, Lancashire with clients throughout the UK and the North West of England including Nelson, Colne, Burnley, Blackburn, Bolton, Skipton, Manchester, Preston and beyond. 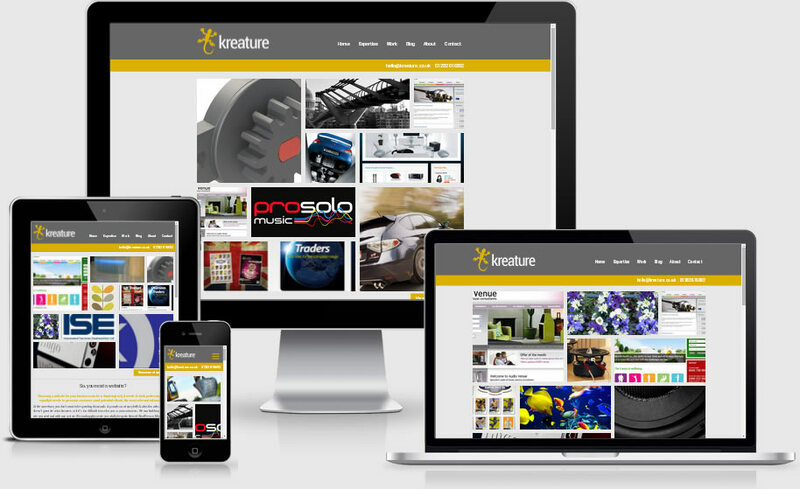 We have customer websites, adverts and logos all over the UK and a few in Europe and the USA. We are equally comfortable running projects, big or small, via email, phone or in person so national and international distance isn’t an issue for us. We have been around for a long time, in fact we started using the internet on a daily basis in 1992, the business was crafted and created in 2001 and finally started trading in 2002. Kreature isn’t a large team of people, and we don’t have big fancy expensive offices with pool tables, pet dogs called “html” or “break out” areas. We focus purely on providing professional affordable website design to customers in Lancashire, the North West and across the UK. What we do have is years of experience in most systems and technologies and a passion for learning new web related tips and techniques every day. We eat, sleep and dream websites and coding and if we don’t know how to do something we have a huge contact list of internet savvy designers, developers, friends and colleagues who are all specialists. Our mission has always been the same, to provide superb professional quality easy to use websites to small and medium sized businesses at an affordable price and with complete customer satisfaction. We have been lucky enough to work with some great clients over the years and the majority of our current daily projects are for existing clients that we have worked with since we opened the doors back in 2002. We still strive to achieve total customer satisfaction and quality work we are proud of every working day and will continue to do so into the future. We were launched in 2002 and have grown in strength and experience ever since our initial website design project. We will guide you through the entire process of getting your website online, or creating your brand, logo or magazine advert, as well as advanced work on e-commerce projects and CMS solutions, including WordPress, Joomla, WooCommerce and more with all of our latest work built with a “mobile-first” approach, producing stunning responsive websites that really drive traffic and custom to your door. Whatever you have in mind, web development, logo development, seo, cms, wordpress, e-commerce or graphic/IT work of any sort, get in touch – if we can’t do it here you can be sure we know someone who can.